La Vista Correctional Facility is located in Pueblo Colorado. 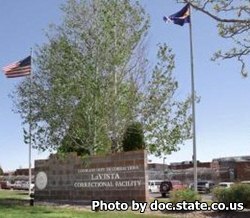 The facility houses both men and women separately with a total population of about 550 mixed custody inmates. Many of the services within the institution are shared by both men and women. This facility uses incentives to help shape inmate behavior. Education courses offered at this correctional institution include a basic adult education, and GED classes. Some college courses are also offered at Pueblo Community College. Vocational skills offered at this institution include cosmetology, greenhouse and gardening management, electrical, custodial skills, and more. Inmates can also receive substance abuse, parenting, and anger management courses. Visitors must have an approved visiting application on file in order to visit. Female offenders may have visiting on Mondays and Fridays from 8:15am-11:15am, Saturdays and Sundays from 12:30pm-3:30pm (by appointment only), inmates can also have visiting from 8am-11am on Sundays. Male inmates can have visits on Fridays from 12:30pm-3:30pm by appointment only, and on Saturdays from 8:15am-11:15am. To schedule an appointment call 719-583-5914. You must arrive for processing before 9 am for morning sessions and before 1:30pm for afternoon sessions.